Australia, and Sydney, in particular, have some excellent craft beer breweries that are well worth discovering. The Inner West suburbs are the hub of all the activity and you can find anything from lagers to pale ales and more. Sydney does not do pints or halves, however, they just do schooners and midis, which are more or less three-quarters of a pint and three-quarters of a half. Australians are quite happy to give you a small taste of a beer before you order. James Squire was a convict who got caught with a case of beer he had brewed from supplies he had stolen. He was sentenced to 150 lashes and then made Sydney’s official brewer. A legend was born. The brewery in Camperdown is a mainstream one and 150 lashes Pale Ale can be found in practically every pub in Sydney. Organised tours take place daily and you can combine the experience with gourmet food. This brewery is in the suburb of Annandale. It organises tours occasionally, but the experience is more about sampling the huge variety of beers on offer. It brews its own varieties, and also have beers on tap from all over Australia. Their most popular beers include the Annandale Pale, the Big Daddy, and Red or Dead. 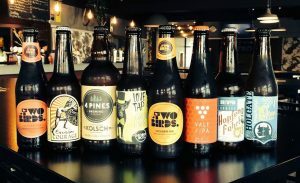 These micro-breweries are found in the gritty suburb of Marrickville. They are about 15 minutes apart on foot (more if you’ve had a few). Willie the Boatman is a quiet place, serving corn ale, pale ale, lager, goose and IPAs. Batch is more of a cosmopolitan brewery where you can get food. The brewery is open plan and you can walk around freely. Grifter also makes the list and again, it is an open plan brewery with a seating and eating area inside. Australian Pale Ale is the favourite here.